How do I transfer my data from Salesforce CRM to Wealthbox CRM? 2. Select the the encoding (we suggest Unicode UTF-8) for your export file. 3. Select Include images, documents, and attachments and Include Chatter files and Salesforce CRM Content document versions to include these items in your export data. 4. Select Replace carriage returns with spaces to have spaces instead of carriage returns or line breaks in your export files. This is useful if you plan to use your export files for importing or other integrations. 5. 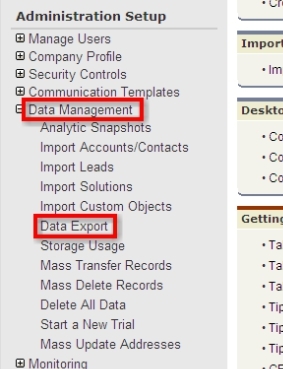 Under Exported Data, select the types of data to include in your export. We recommend that you select “Include all data” if you are not familiar with the terminology used for some of the types of data. 7. Salesforce creates a zip archive of CSV files and emails you when it’s ready. Note: The zip file will contain several CSV files. Some of the files will contain contact details that will need to be merged into one file that can then be imported to your Wealthbox workspace. This may require assistance from somebody who has advanced Excel knowledge.